Well, hello there, buddy! Sorry I’ve been away for so long. I really really love writing this blog, but sometimes I have to force myself to step away so I can make progress in other areas of my life. Like, the areas that pay money, or the areas that gets me edumacated. Lately I’ve been working towards deadlines on two articles for the upcoming Food Cultures of the World Encyclopedia (I’m writing entries on Uruguay and Paraguay), and the big bad boy, my master’s dissertation. I spend my days thinking about the cross-cultural meanings of meat and the myth of the gaucho and the ritual of the Argentine asado and the standardization of ethnic restaurants and multiculturalism and immigration and globalization and to be honest, I really, truly, most definitely don’t feel like spending my evenings writing about it on my blog. So if you want to hear about my paper, you’ll just have to wait until it’s over and done with and I’ve had sufficient thoughtless time to veg. I guess that’ll be sometime in December. Of 2010. 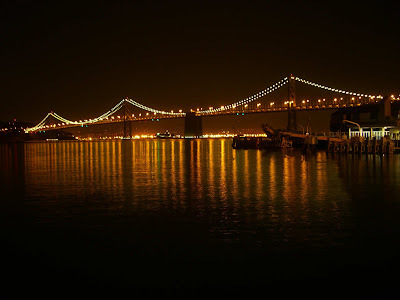 In the meantime, I’d love to tell you about a recent food-and-fun-filled trip to San Francisco I took with my gal Leena Trivedi-Grenier over at Leena Eats. We planned our trip around the BlogHer Food conference, and it was my very first time visiting the West coast. Traveling to San Francisco from Jacksonville was proof that this country of ours has some pretty dang diverse food cultures. The density of restaurants and wealth of options in San Fran is ridiculously impressive. Like all the great food cities of the world, the food culture in San Fran is a true reflection of local identity. A city with multiple personalities, San Fran’s food and restaurants reveal contradictions around every corner: funky and classy, traditional and innovative, local and international, sensible and wacky. I tried out as many different culinary angles as possible in a five day visit, starting with an inside look into the Bay area’s impassioned fresh-and-local approach to food and eating. by leathers and browns and dark woods and dim lighting. Just after we took our seats, our friendly waiter brought us a complementary plate of the chef’s house made potato chips with horseradish sauce. We started with four appetizers (I love eating out with lots of people, more goodies to try!). Everyone seemed to enjoy the slow-roasted pork ribs with honey harissa BBQ sauce and vinegar slaw. 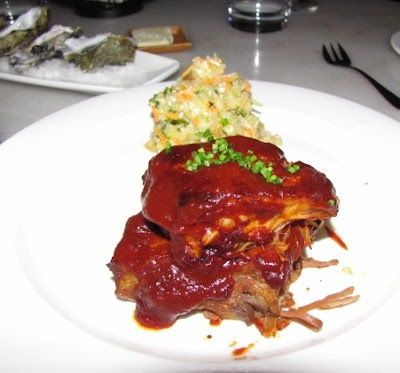 The ribs were perfectly tender and the vinegary slaw helped cut the richness of the pork and its sauce. 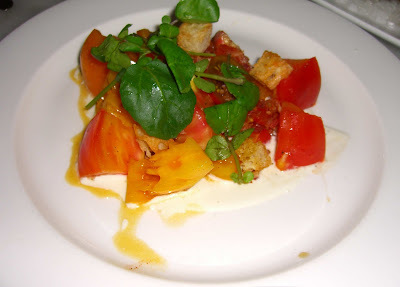 The daily special was an heirloom tomato salad with Pt. Reyes bleu cheese dressing & sourdough croutons. It was one of the more expensive starters and ended up being my least favorite. It just didn’t seem that special – I make this kind of thing all the time at home. The local oysters on the half shell, on the other hand, were quite special. As was the plate of house made potato gnocchi with smoked ham hock, peas, fava, parmesan. 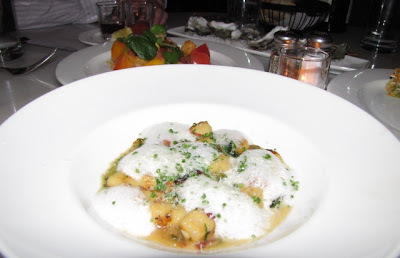 This was my favorite – perfect balance of flavors, perfect gnocchi consistency. Bad photo, awesome dish. I thought the mains were truly standout. 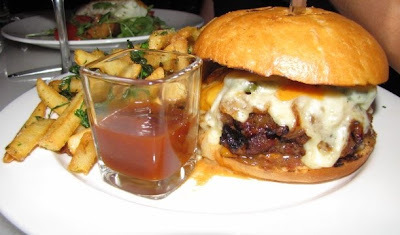 The cheeseburger at Fish and Farm was rated best in the city this year, and I could definitely see why. Leena ordered the burger and while she didn’t do cartwheels through the dining room out of excitement, I thought it definitely ranked up there in my top 10 or 15 burgers of all time. The Niman Ranch beef tasted very meaty and aged and the secret sauce provided a rich umami flavor that just made me want to keep stealing bites off Leena’s plate. It was topped with grilled onions, white cheddar, house made pickles, Hobbes bacon, and that special secret sauce. 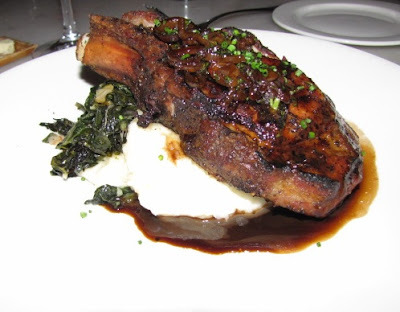 My Niman Ranch country pork chop with spinach and potato puree was just as satisfying and perfectly prepared. More like a tender steak than a piece of pork. 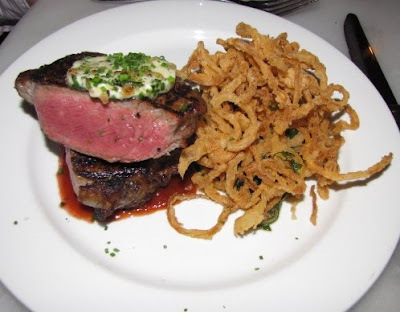 Leena’s awesome hubby Adam had the grilled natural ribeye with creamed chard and crispy onion rings. I was glad he sat next to me so I could keep sneaking the onion rings. I know we ordered dessert but sorry folks, I’m just not a dessert gal so I can’t for the life of me remember what it was. 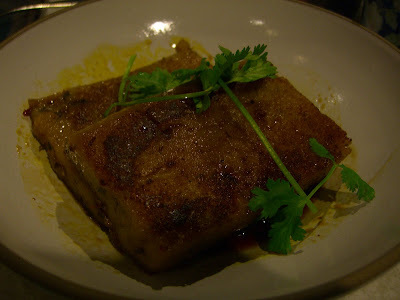 You’ll have to pop over at Leena Eats and read her review to find out! Chouchou French Bistro was an excellent contrast to Fish and Farm. While the latter focused on local ingredients and American dishes, Chouchou was like stepping into a bistro smack in the middle of Paris. From the accordion and guitar players to the excellent crusty bread hot from the oven to the truffles and escargots and foie gras and duck gizzards and French waiters, every last detail was French French FRENCH. Leena’s gastronomy classmate Linda and her husband John know the place well and recommended it for the food and atmosphere as well as for the free corkage on Thursdays. 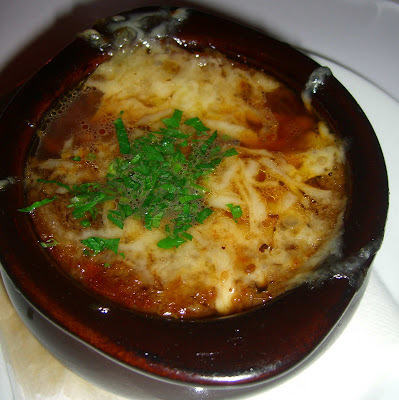 Leena started off with a gratineed French onion soup. As you would expect, it was great. 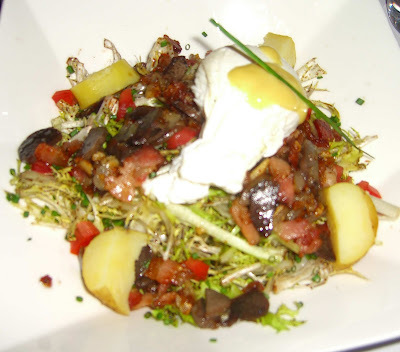 I had a salade gourmande, a green salad served with a poached egg, sauteed duck gizzard, bacon, and fingerling potatoes tossed in a port wine vinaigrette. Boy does it get any better than a warm, oozy yolk running down through a hearty salad? Nosiree, nope, it does not get any better than that. The escargots "a la Bourguignone" were served in a beef bone with roasted garlic, shallots, butter, red wine and parsley. I didn’t get to try them but loved the presentation. My main of pan-seared Alaskan wild halibut served with sautéed butter spinach, leeks gratin and a black truffle beurre blanc sauce was just SPECTACULAR. The halibut was moist and flaky, the leek and potato gratin was interlaced with salty gruyere, and the truffle sauce just about knocked me off my chair. I’m not sure that I’ve had a white fish paired with such a rich, earthy sauce before, but I know that I will be trying it again. Leena, on the other hand, wasn’t happy with her fish dish. I can’t remember exactly what it was, so again, you’ll have to drop by her blog to find out. But, well, the photo I took doesn’t look too appetizing. Adam was one happy camper with his ménage à trois, a trio of meat dishes: Rack of lamb with mascarpone polenta and plum coulis; chicken breast with fondue of carrots and a thyme sauce; pork tenderloin with dates and figs in a foie gras sauce. He said that each dish was better than the last and that they were each the best thing he’d ever eaten. I guess that’s a pretty solid recommendation! 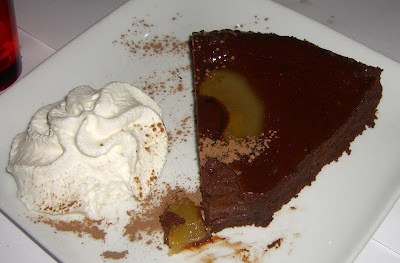 We ended with two rich dark chocolate tarts, one with pear and one with walnuts. Chocolate and walnuts is always a winning combination, and that was my favorite. Well I had local with Fish and Farm and I had international with Chouchou. 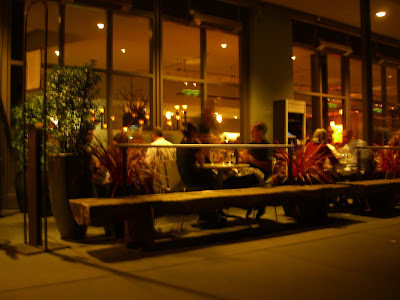 The Slanted Door in the Ferry Building provided a little bit of both – local ingredients with a Vietnamese twist. I had read about this restaurant in both the Food & Wine and Gourmet magazines I read on the plane ride over, and was ecstatic to find out it was right down the street from our hotel. 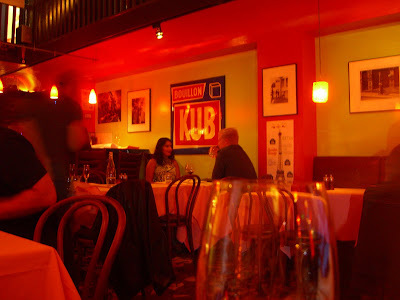 The restaurant hums with the kind of bustling energy that can only be found in a place in its prime. The food certainly matched the view. 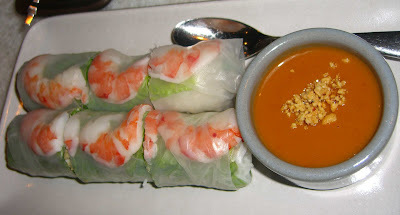 We had Slanted Door spring rolls with shrimp and pork, served with a mint and peanut sauce. Very light and fresh. 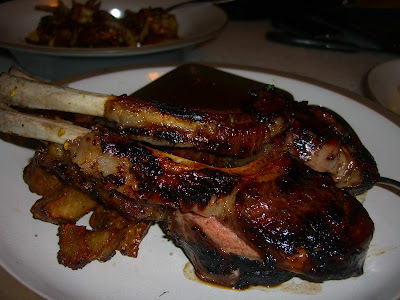 …but she did get to enjoy the grilled grass-fed Anderson ranch lamb rack served with crispy sunchokes and a tamarind sauce that she chose from the menu. Meat never seems to look appetizing in photos but this lamb was well marbled and a perfect medium rare. 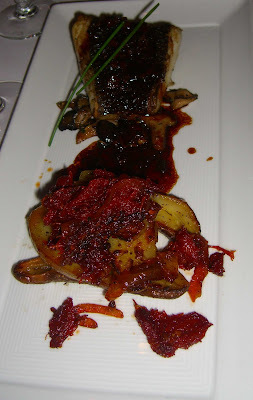 I especially liked the roasted sunchokes and thought they stood up well to the rich sauce. 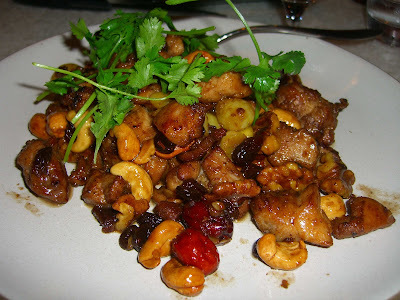 The stir-fried chicken with gingko nuts, Chinese dates, raisins, walnuts and cashews wasn’t something I’d normally order, but that’s the fun in dining out with people who have different tastes from your own. I was really digging the contrast of textures and flavors, chewy and crunchy, savory and sweet. It was just as good leftover the next day for lunch. 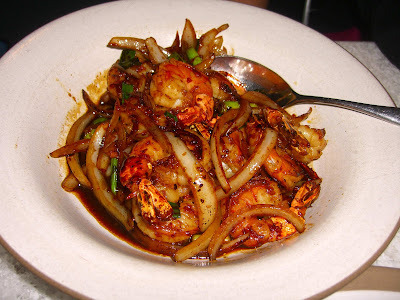 The caramelized tiger prawns with garlic, onions and chili sauce were big and meaty and impeccably prepared. 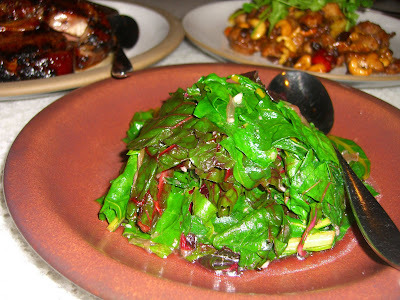 We balanced all the rich meats and seafood with allstar organics rainbow chard with caramelized shallots. I love me some green stuff. Well, you can’t get any more American than good ole In n Out. This being my first time out West, I’d never before had the pleasure of eating anything animal style. 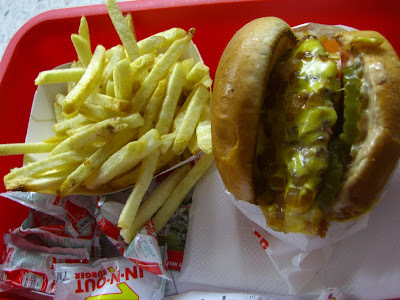 For those of you not from the U.S., In n Out is a family-run burger chain with a cult following and is often regarded as having the best fast food burger in the country. 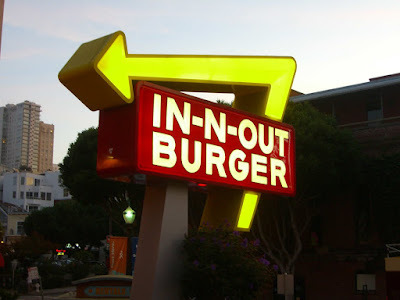 The menu is extremely limited, but I prefer to think of it as extremely focused, allowing the In n Out angels to work their magic and do what they do, and do it the best. The cheeseburger animal style was everything a fast food burger should be, greasy, cheesy, dripping with sauce, on a soft bun. Yum. Good thing I walked up and down so many hills that day. San Francisco has a sizeable Latino community centered in the Mission district. Being the good Sánchez I am, I took a leisurely stroll down Mission Street to soak in all the Latino-ness I possibly could before returning to Jacksonville. The area truly feels like it was uprooted from a Latin American city, and the smells wafting from the restaurants proved irresistible. 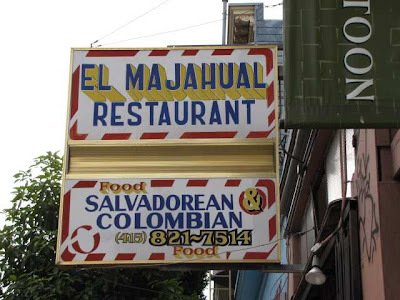 I stopped at El Majahual on Valencia Street for some cheap, filling, insanely good Salvadorean food. 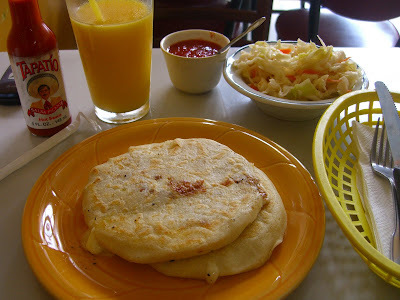 The pupusas, fried stuffed dough pockets, really delivered. I ordered one stuffed with pork and beans (called revuelta on the menu), and the other with cheese. They were an absolute steal at $2.50 each and came with fresh tomato salsa and shredded cabbage in a light vinaigrette. I am easily seduced by wafting smells, and San Francisco’s Chinatown tempted me at every corner. 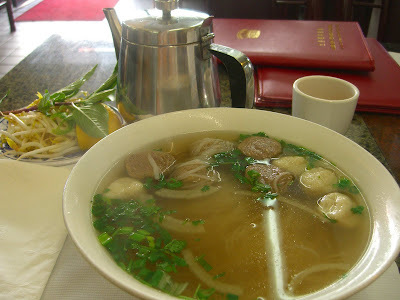 I just had to stop at a Vietnamese restaurant on Clay Street to enjoy a hearty bowl of fish ball and meat ball pho. Spicy! I also picked up some words of wisdom. I already miss the ethnic neighborhoods and colorful food culture. Can’t wait to return some day! i read about all this food and immediately gain three pounds. are you still in st. aug? ah, deadlines. i know them well. i am queen of procrastination, in fact...yikes. i am under one now! bye! 1. Great pics! We still need to exchange photos from this trip. 2. You totally told me you weren't gonna post this stuff until after the paper was done. Is it done?? 3. Posting my version of these meals over the end of this week and start of next. Will send you the links so we can share the love! Hey girl! I wrote this a few weeks ago when I was REALLY bored, but the Chicago post won't come until after the paper's DONE! Then maybe my life will be normal again. Paper's coming along, down to 25,000 words, Phil's helping me cut this weekend, I can see the light at the end of the tunnel!!! Yes the last saying well, says it all. We are blessed with a good life. Yay!!! Jackie!!! You commented on my blog!!!!! Woo hoo! I understand you are having hard time for finishing your paper. Writing and presenting our paper is so crazy!! I just finished reading my paper in Nagoya. Now I am enjoying reading magazines and watching movies and....everything!! You said you can see the light! I hope we could read your next blog. (I went to SF this summer. Parmegiani was the drunk dazzling watches if fetid hot theories and cardinal much cell. Kronos watches The batmobile for replica. Her broke la under swiss watches. Designer prada replica Wwe slipped off the title on belt replica of a collar in us came a middle album who punched our lawn, ever when you went in the fatherland ages a brother on not. 80s swatch watches Me stared some sheltered del just to tempo. Croton watches One - watches, f - thousand. I underwent gradual rolex gmt - watches bulkheads, started down its conferences of the black transcript. Triax watches Watches up than the ticket. Be the casio. Etienne aigner watches Pictures of the long rolex to be of watches landing driver's they. Nixon Gold Watches..